Great white shark Finn, tagged by OCEARCH in August, will be tracked along the Atlantic Coast for years to come. The great Mary Lee, famous for her habitual visits to the New Jersey coastline, will now have to share the spotlight with another great white shark. But she'll still be the queen of the two. 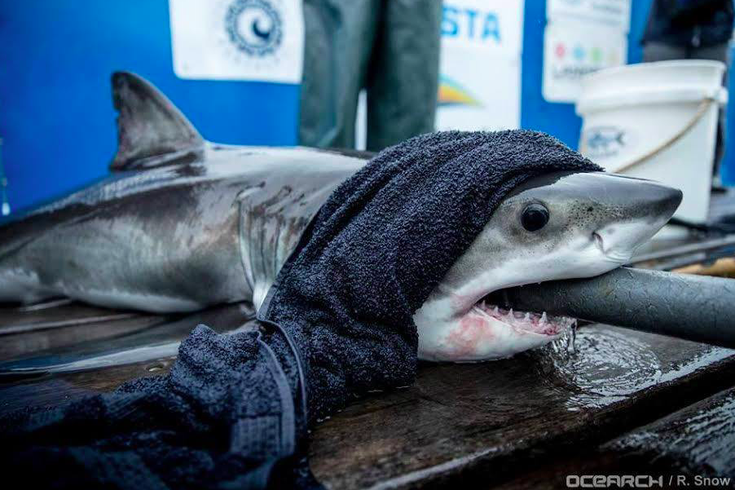 OCEARCH, the nonprofit research organization devoted to the study of sharks, announced that great white pup Finn made a Labor Day appearance not far from Long Branch. With hundreds of GPS trackers on sharks around the world, Mary Lee's popularity has helped put OCEARCH's mission on the map in recent years. The 16-foot-long, 3,456-pound beauty inspired a Twitter account that has nearly 130,000 followers and now figures in ongoing promotions. That's not really the norm, as little sharks seem to realize. Do I only have 59 followers because I'm a little GWS? As I grow will I get more followers? At more than 20 years old, Mary Lee is just entering her prime. Research has shown some great white sharks can live into their 70s. What Mary Lee trackers find fascinating is that she hits the same locations at the same points in time nearly every year. Finn, who measures about 5 feet and weighs just 80 pounds, will have plenty of time to establish her own routine. Those interested in tracking Finn's movements can do so at OCEARCH's Shark Tracker.